We're spotlighting some of our BBC employees from around the country– including military veterans and spouses– in recognition of NAA's RPM Careers Month! Continue reading to learn more about Kristen Hluchy, receptionist. How many years have you been a military spouse? I have been a military spouse for a year (recently was our anniversary!). What made you decide to enter in the military-area for your career? 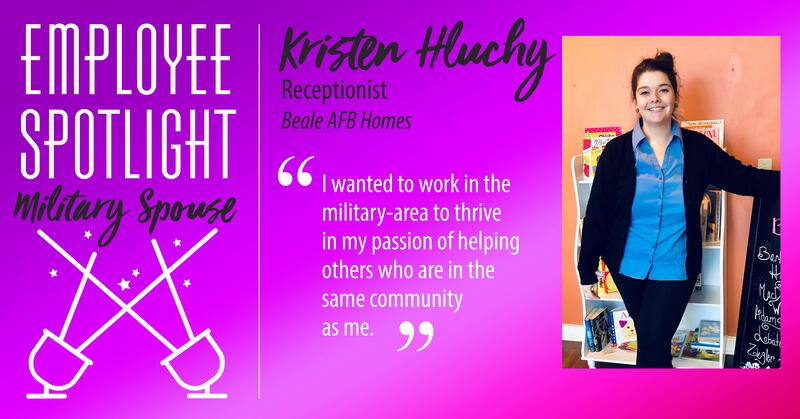 I wanted to work in the military-area to thrive in my passion of helping others who are in the same community as me. How long have you worked for BBC? I’ve been working here for about 5 months now. What do you enjoy most about your job and working with military families? I love working with my coworkers. It’s an amazing work environment and I love seeing military families coming in. I am so grateful I get to share the same connections and experiences as most of the families that come in. Being that I live in base housing I get the opportunity to truly tell them how amazing our community is at Beale.